One of the really neat features that comes built into Windows XP is the ability to write to (or burn to) CD-R and CD-RW discs without third party software, such as Nero. This, coupled with Windows Media Player’s new music burning functionality, means that you don;t have to buy expensive software just to create great CDs (of course you will need a CD burner and some blank CDs though). As you burn CDs through Windows XP, the burn process may fail. If the burn process does fail, Windows will assume it failed because it tried to burn the CD faster than it should have. 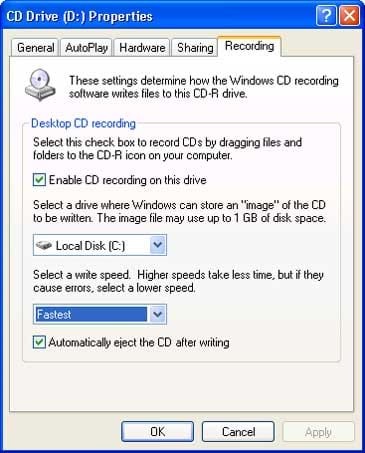 As a result, Windows will reduce the CD-burner’s recording speed. Over time, you are certain to experience failures in the burn process for a number of reasons, but Windows will not discriminate between random errors and speed-related errors. Because of this logic, Windows will systematically lower your computer’s burn speed over time. If you have noticed your CDs are taking longer and longer to burn, follow the instructions below to speed it back up again. Open My Computer, right-click the CD Drive icon, and then click Properties. Click the Recording tab to display the settings shown in Figure 1. Make sure the Enable CD recording on this drive check box is selected. This setting turns on the built-in CD recording features included with Windows XP. The only reason to disable this feature is if you always prefer to use a third-party program and want to avoid any possible conflict between that program and Windows XP. Make sure that the Fastest setting is enabled. This will ensure you get the fastest possible burn, but it may also increase the likelihood of CD burning errors. For increased reliability, you can dial the burning speed back to 18X or so. If your drive is configured for optimum performance, but you end up with coasters instead of readable CDs, check to make sure you’ve installed Windows XP Service Pack 2. Problems in the original release of Windows XP resulted in problems with certain CD-R drives; these issues were fixed in SP2. NOTE: If you don’t see a Recording tab, then Windows XP doesn’t recognize your CD burner’s recording capabilities. Check the Windows Hardware Compatibility List to make sure your drive is on the list. If the drive is listed and you can play CDs, but no Recording tab is visible, you’ll need to take your computer to a service center for repair.